This book is a must read for anyone interested in Hippocrates’ dictum: “Let food be your medicine and medicine your food”. This book focuses on the therapeutic effects of broccoli phytochemicals, in particular certain glucosinolate metabolites and flavonoids. This book is organized in such a manner that people with only a basic background in the biological sciences would profit greatly. Anyone interested in any area of nutrigenomics would profit from reading this book as well. This would include horticulturists interested in how phytochemicals may be therapeutic, as well as nutritionists and other health professionals who wish to better understand how diet may influence gene expression and thereby health. Persons engaged in the food-processing industry will also find this book profitable. This book will be of especial interest to graduate students as well as health profession students. The book starts out with a chapter outlining the role of Professor Paul Talalay of Johns Hopkins University and his colleagues, whom initially identified activators of the Nrf2 signalling pathway as playing a critical role in the anti-cancer properties of certain phytochemicals and then went on to greatly develop this area of nutrigenomic research, most recently with human clinical trials. Since many of the therapeutic effects of broccoli consumption can be attributed to specific glucosinolates, two chapters deal with glucosinolates in general (Chapter Two) and glucosinolate distribution in different broccoli cultivars specifically (Chapter Three). Nrf2 activators will influence xenobiotic metabolism in a number of ways; hence, Chapter Four gives an overview of xenobiotic metabolism. Chronic diseases, a major target of nutraceuticals, are a major health concern and place a huge burden on the health care system. Chronic diseases are driven by oxidative stress and generalized inflammation. To understand the medicinal effects of plant bioactive compounds requires an understanding of the mechanisms of oxidant production and scavenging, how oxidative stress affects signalling pathways, and the roles of certain phytochemicals in countering oxidative stress and inflammation. This is the topic of Chapter Five. Chapter Six outlines the Nrf2 signalling pathway and its role in regaining redox and metabolic homeostasis. Broccoli also contains bioactive flavonoids that influence xenobotic metabolism and Nrf2 signalling. Chapter Seven deals with flavonoids with a focus on the major flavonoids found in broccoli, quercetin and kaempferol. Chapters Eight through Eleven outline some of the basic research examining the effects of sulforaphane on x-irradiation-mediated damage, UV-mediated skin damage and perinatal ischemic insults. Chapters Twelve and Three give an overview of some of the clinical trials that involve intake of sulforaphane/broccoli sprouts. 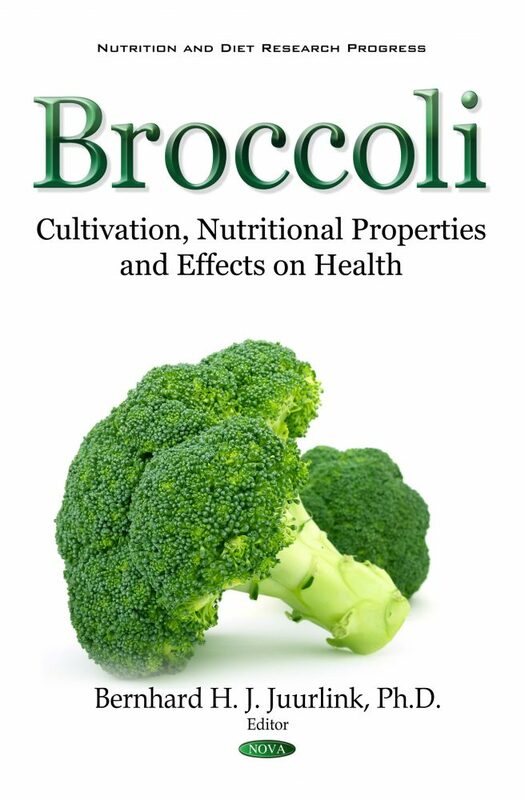 The last four chapters deal with the agronomic aspects of broccoli, including cultivation, post-harvest processing and how various cooking methods affect the bioactive components in broccoli. This book was designed for people interested in the nutritional properties, particularly the nutraceutical properties, of foods. This book would be of interest for those people who deal with particularly the post-harvest treatment and storage of foods, various cooking methods that better preserve the nutrient properties of foods, dieticians and other nutritionists as well as academics and graduate students in the general area of nutrition and nutrigenomics.